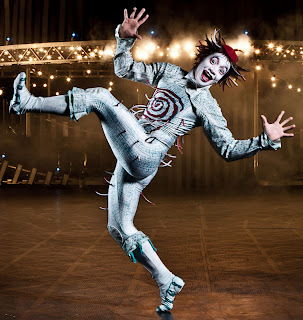 Aristic-athlete or athletic-artist, whichever term you care to use, it applies to the current offering in Indianapolis by Cirque du Soleil (French for "Circle of the sun"). The show's title, Quidam (key-DAM), is Latin for "someone" or "somebody" and reflects the nameless stranger you don't notice in everyday life, passing by on the street or elsewhere. The story line takes bored Tween Zoe' on a surreal trip to a land that lies somewhere in the vicinity of Cat in the Hat meets Edward Scissorhands, complete with floating parents, headless characters and a general uneasiness as to where it will all lead. But lead Zoe it will, into a world that opens her mind to other possibilities than her rut-life existence at home. For those who have attended other Cirque performances, this one is slightly different. No trampolines, few acrobatics and fewer big power plays. Instead the movements are slow, calculated and complex. Detail to attention must be adhered by audience members or miss out on the magnificence of it all. Not a flashy show, Quidam. This go round is an intensely, intricate show. Witness the ability to master the laws of physics in Statue where two performers balance on each other with minimal contact. Rotating and maneuvering each other, the sheer amazement factor pulls you in. The contortionist twists and manipulates her body high above safety's reach. Zipping toward the ground then pulling back just in time is equally as exciting as a man-eating tiger. At first it is tempting to look around for a 13-man pyramid and brush off the quiet artists focusing on their intricate movements. Although the performed-live, Benoit Jutras written music is amped up, the show itself is quieter in comparison. This touring show brings the audience to the forefront, and stage, much more so than other Cirque shows, with the difference being a more comedic touch, also. Creating an on stage scenario, with outrageous ad libs from the people "borrowed" from their seats, the hilarity proved one of the audience favorites. Bottom Line: As one of its earlier shows, Quidam demonstrates an intense, yet subtle version of Cirque du Soleil's magnificent creativity. For tickets, directions and details, visit BankersLifeFieldhouse.com. Elizabeth J. Musgrave is a syndicated columnist, travel writer, performing arts and restaurant critic. Catch her new column, Infused, at GottaGo.us and FoodandDrinkDigital.com, and as Indy’s Entertainment Adviser on 93 WIBC. Follow her on Twitter @GottaGo, LinkedIn and Facebook. Gotta Go is published on Gottago.us, BroadwayWorld.com, in M magazine and the following newspapers: South Sider Voice, Indiana Weekender, New Palestine Reporter, Pendleton Times Reporter and Fortville-McCordsville Reporter.